Acer palmatum Kinshi is a fantastic Japanese maple with thin, linear, deeply lobed foliage that gives the entire plant a fluffy and light appearance. This Japanese maple has a slightly weeping and slightly domed appearance making an interesting shape for year round interest. The foliage emerges green and stays vivid light green throughout the spring and summer. In the autumn Acer palmatum Kinshi comes into its own with striking orange colour. Kinshi is certainly one of the very best for good orange autumn colour. Expect an approximate height and spread of 4 x 4 metres in 20 years from Acer palmatum Kinshi. This maple can be container grown given the right care. 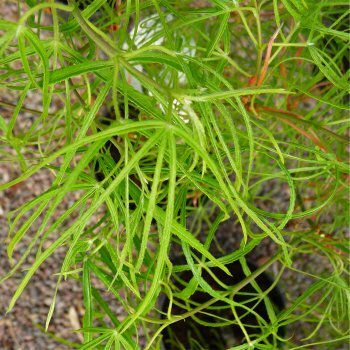 Planted in a slightly sheltered position avoiding heavy, waterlogged soils and ideally in partial shade, this small tree will provide vibrant colour for a lot of the year. Pot grown Kinshi Japanese Maples can be planted at any time of the year. Firstly, remove all weeds and grass within a metre of your desired planting hole then dig a square hole as deep as your root mass and approximately 2x as wide. To help your tree establish more effectively, we advise sprinkling root grow in the hole, especially if you have poor soil.